In this article, we will go over what current division is, its importance in a circuit, its mathematical formula to calculate how current gets divided in a circuit, and how a current divider fits in circuit design to produce useful electronic roducts. You will learn that a current divider is a very useful concept in order to build real-world products. Many devices operate on this principle. We will even go over, in this article, many electronic products that are designed either partly or wholly based on the laws of current division. A current divider circuit is a circuit in which the main current from the power source is divided up in the circuit and, thus, different amounts of current are allocated to different parts of the circuit. You can see how current divides up when a circuit is in parallel, as the two resistors are. Current takes the path of least resistance. So most of the current goes through the smaller-valued resistor, which in this case is the 5KΩ resistor. So if you want more current to flow through a particular part of a circuit, put less resistance in that part of the circuit. Therefore, more current will travel throught that part in the circuit. Conversely, if you want less current to flow through another part of a circuit, put more resistance in that part of the circuit. This is how current division works. Note that current only divides up in a parallel circuits. In series, current is the same across all components. 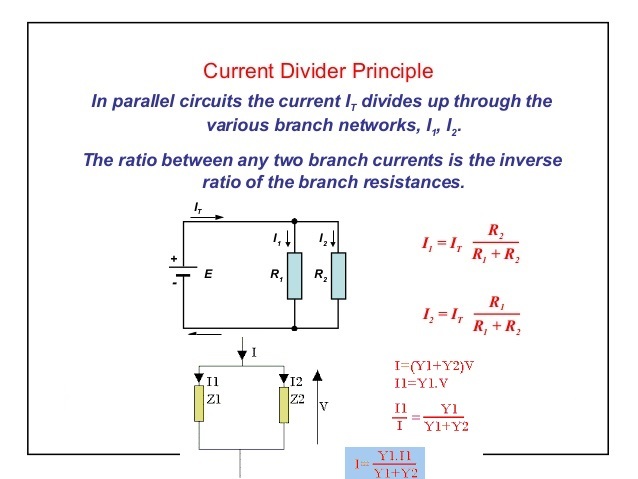 Now that you know conceptually how current division works in a circuit, let's go over exactly mathematically how current divides in a circuit based on the current power source of the circuit and the resistance values of the resistors or loads in the circuit. 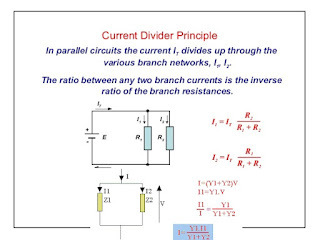 The current that goes through a branch in a parallel circuit is equal to the product of the other branch's resistance and the main current source divided by the total resistance of all the branches. where IX is the current going through a certain branch where you are solving for, IS is the current power source, RT is the total equivalent resistance value of the parallel resistor circuit, and RX is the value of the resistance of the branch for the current for which you are solving. Just like before, current takes the path of least resistance, so most of the current goes through the 5KΩ instead of the 20KΩ resistor. If you want to calculate current division in a circuit, visit our Current Divider Calculator . This calculator allows you to calculate the current which goes through any branch in a parallel circuit.